I’ve heard about bloggers getting sent free stuff, with the idea that said blogger will write about said product, offering some publicity. It had never happened to me — until a few weeks ago. A company called Solo sent me a cycling jersey — for me to review. Of course, the Eugene Bicyclist Ethics Handbook clearly states that taking free stuff just for writing about is, quote, “icky.” We have standards of credibility to maintain over here. So here’s the deal: I’ll give you my honest appraisal of this jersey. And then I will put it up for auction with proceeds going to help groups that do cycling advocacy and safety work. I’ll get to the details of that later. For now, let’s talk about this jersey. The brand is Solo, a New Zealand company. The jersey is a model they call the Classique. The idea is to honor the nations and riders of “cycling’s golden era” — the 1950s, 60s and 70s. 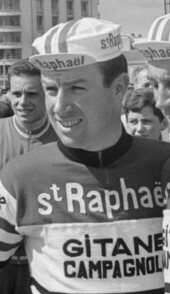 That was the era, of course, when top riders engaged in rampant amphetamine use and occasional bribery. But it’s probably best we don’t mention that. Let’s move on. I have to say I was fooled. At first, I thought this was a reproduction of a real pro cycling jersey from the Golden Era. Maybe, I thought, this was Seamus Elliot’s first team! Well, no. Turns out Dempsey’s is fictional. The team never existed. And the design never existed. But I don’t think that matters, because the jersey is super cool. It appears to be very well made, too. It is not wool, by the way, in case you were wondering how far they took the whole retro thing. No, this is modern jersey, with modern space-age fabrics — with just a retro appearance. But whoever the designers were — who were given this task of making a new jersey that harkened to the amphetamine-soaked years of the Golden Era — they did a very nice job. By the way, this jersey retails for $139, as do all the Classique jerseys, except for the one honoring France, which goes for $119.99. Why France received this slight, we cannot say. So here’s your chance to get a very nice piece of cycling clothing and help out some organizations that do good work here in Eugene. This will basically be a silent auction. 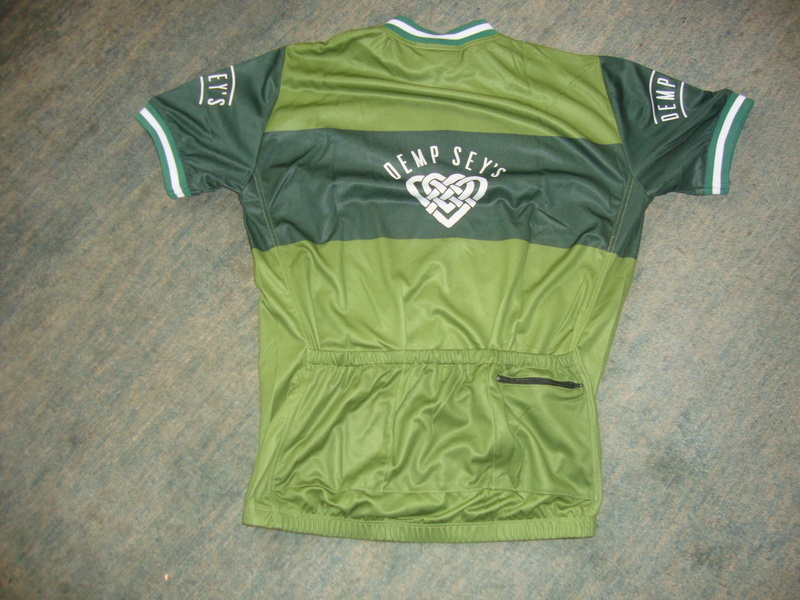 What you are bidding on: This Solo Dempsey’s jersey seen in the photo. Brand new. Size Medium. Retails for $139. I tried it on, but did not sweat on it. How to bid: Leave a comment with a bid amount. If you are out-bid, you are free to bid again — as many times as you want. When the auction will end: Bidding will remain open for one week, until 11:59 p.m. Thursday, April 26, 2012. GEARs Education, a local cycling advocacy group that offers safe cycling classes and otherwise helps promote cycling safety and that stands up for cyclists’ having a legitimate place on the roads. Jane Higdon Foundation, which was set up in memory of the Eugene woman who was killed by a truck while cycling on Territorial Highway. The fund makes two types of grants: to improve cycling and pedestrian safety, and to help empower girls and young women. Eugene Safe Routes to Schools, which promotes safe cycling and walking to school for kids. Then what: The high bidder will deliver me the check, which I will get to the right people. And I will deliver high-bidder the jersey. I’m going to set the starting bid at $20, and you people can take it from there. There’s no other catch here. Just bid. Go for it. Dang… I’m not even Irish… Anything from Portugal? $55 – It’s for a buddy with an enlarged prostate. A winner! To the guy who has the buddy with the enlarged prostate. 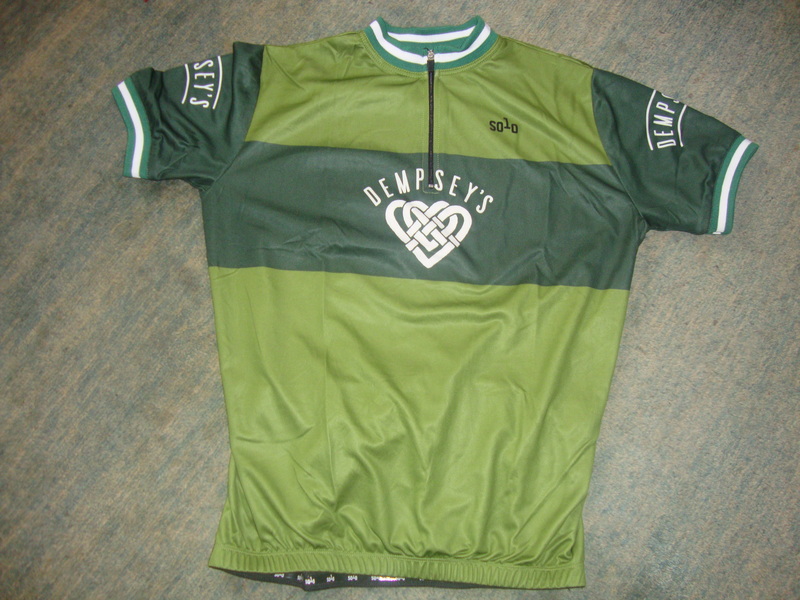 I think in Ireland they refer to that as having a “Dempsey.” Congrats to PDXCyclistWK. Aye! This would be the proudest day of me cycling life it would! Happy to support a good cause! Since I’m up North, bringing my North dollahs, does this make me a “jersey” bagger? ← Hey, what’s with the ads?